Hubbs Greenhouse has been a fixture in the Marengo area for the past 50 years. Since purchasing the greenhouse from Mildred and Don Hubbs in 1978, Dolores and Tom Dickerson have developed the family-run business into one that serves many customers throughout the surrounding counties. 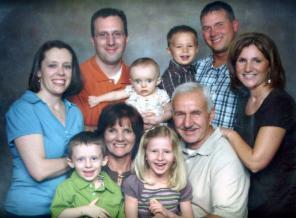 For over 30 years Dolores and Tom have offered quality stock at affordable prices. Over that time, they have added many varieties of annuals, perennials, nursery stock, and tropical plants to their selection. From the few original small Quonset huts, the facility has been expanded to its current size, with more than 2 acres under greenhouse production. Son Peter and daughter Cathie, both with outside careers, still help out during the busy summer months and the Christmas season. With many employees nearing the 20-year mark, all Hubbs employees take great pride in their excellent customer service. Over the past 10 years Hubbs has “branched out” into landscape design, yard maintenance and installation of paver walls, beds and walkways. Stop in and get to know our team. We will be happy to show what we can do for you. Cari started with us when she was just 15! All through high school and college she has been a valued employee. Cari brings her contagious energy to work every day. Customer service is key to her success, and her knowledge of the plant material is exensive. 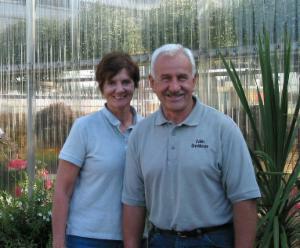 Cari is retail manager and an essential member of Hubbs Greenhouse. 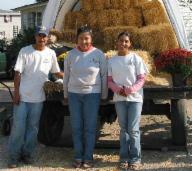 Sisters Maria and Roci, with brother Pepe, have worked at Hubbs Greenhouse for a combined 28 years! Having learned the production side of the greenhouse from the ground up, they rival any master gardener with their knowledge of plant materials. Jose Manuel and Dino are in constant motion. They build greenhouses, fix broken water lines, and deliver and plant any and all plant material. They are also pros at laying pavers for patios and landscape walls. What a team!